Almost everyone knows hummus, but are you familiar with Labneh ? 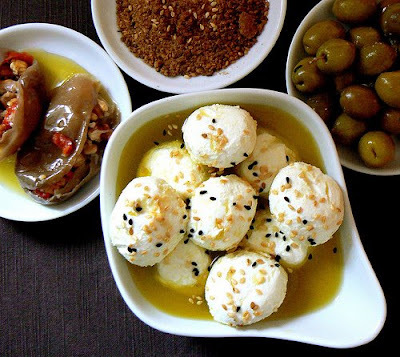 Labneh is a delicious Middle Eastern spread-speciality made from yoghurt and over a period of days then transformed into a delicious fresh cheese with a creamy texture and a hint of yoghurt sournesss. It is traditionally served drizzled with olive oil and dried mint, and in its most simplest form enjoyed with Arabic bread and a cup of black tea. A real no-fuss delight! Well what I just described is Labneh, but from that you can also make Labneh balls, which for me personally are even yummier. The difference is that in it’s balls version (OK this "balls" thing is going to start sounding funny now, but please - do not read this post with a dirty mind!) all the humidity is removed, the texture is firmer, and the balls need to be conserved in a jar filled with olive oil (whereas Labneh can be conserved in a container, the way cream cheese is). 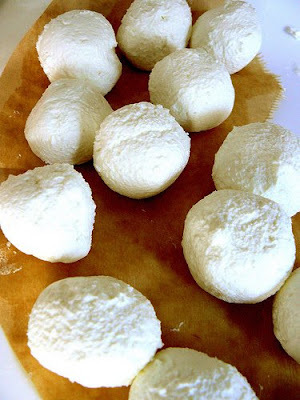 You can either buy Labneh balls or make them. Since I live in France and it not as easy to find them compared to the Middle East, we enjoy making it at home. It’s nothing difficult, the only thing you will need is patience! Removing the humidity from the balls. They are ready when the muslin is no longer wet. 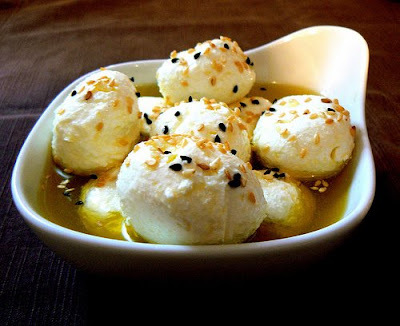 Serve Labneh balls floating over olive oil! About 1kg of Yoghurt- try to get the creamiest type available. In France I use “fromage blanc”. Remember to add a pinch of salt to the yoghurt. 1-Place the strainer over a bowl. Place the muslin over the strainer, and pour the yoghurt over the muslin. With the muslin pieces that are overlapping on the sides, cover the top surface of the yoghurt. What you now have then is yoghurt wrapped in muslin, sitting over a strainer, and the strainer is over a bowl. Tie the muslin so it forms a “yoghurt contained bag”. Over 1-2 days, all the water/humidity will drain out of the yoghurt and will drip into the bowl underneath. Just make sure that you change the muslin cloth every 24 hours for hygiene. 2-Now that the humidity has been removed, when opening the muslin parcel, you will notice that the yoghurt has become firm with an almost cream cheesy texture. This is Labneh, but we still have to go a step further. 3-Bring a plate and cover it with a clean piece of muslin. Take the labneh and shape into balls. Place the balls over the muslin (which is over the plate) and when all the balls are formed, cover (without pressing!) with another piece of muslin. Every morning/evening check to see how much humidity is being absorbed by the muslin, and make sure to change the muslin regularly. You’ll know the balls are ready when the muslin stops absorbing humidity. 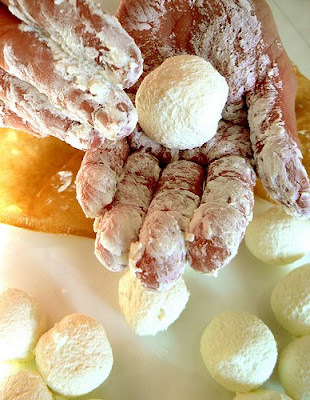 4-Now your Labneh balls are ready. You can either enjoy them plain, or roll them in mint, za’atar, sesame seeds, hot pepper, etc… To preserve them, place the balls delicately (they can break easily!) in a wide jar, and at the end fill up with olive oil. Take note that you do not need to place the jar in the fridge (not good for the olive oil). *NOTE: Some of you are commenting as to what alternatives there are to muslin, so I would just like to point out that if you do not have muslin, coffee filter strainers are a perfect substitute! I personally use that if there is no muslin around! Good luck, and if you have any further questions please feel free to ask! Absolutely wonderful Marianna! I will be making this next week. Of course I will give you credit! I love the creaminess and the olive oil with it and all the wonderful Middle Eastern Spices. I love labneh and your balls look wonderful. I've never tried these but it looks like something I would love...adding it to the list! Marianna, ever since I got a Donna Hay magazine that features recipes for homemade cheese I've been meaning to try my hand at these. I just need to buy the right cloth. I had never heard of these--but am glad I know about them now!! I love Middle Eastern food so this seems like a natural addition to my repertoire! Thank you for posting this! I've been straining yogurt lately and have also made some zaatar. I'll try labneh balls this weekend! Aha - I was going to try to track down some muslin because I thought that might be necessary - but I've thickened yogurt over coffee filters before and been pleased. I can't wait to try this! Yes, coffee filters work perfectly fine! I will have to edit my post to clarify that!! :-) Thanks for passing by Nezrite! I am new to this but happy to have found your blog. I don't have a blog of my own but I promise, no rude comments. I have been a professional Baker and chef but I can no longer stay upright for that long without my knees complaining. So now I bake and cook for friends (and myself). I have one more thing to add to your labneh balls page. Here , in the US, we have a very loosely woven cloth called cheese cloth that works for making labneh (and coeur a la creme!). I am sure you have this in France but I don't know what it is called. You have to use several layers, but it works. Thanks again, I like your style. I remembered one more thing you might try with labneh, although this works best with less dry labneh, about 24 hours. Sweeten the labneh with a flavorful honey such as chestnut or buckwheat. there were bowls of fresh fruit and roasted almonds. I served this at a wedding and people loved it. Hi Maris- you can keep it in the fridge if you prefer. I've done both ways - in and out of fridge- and they both work. The key thing is that you make sure all the water/humidity is removed from the yoghurt :-)When the labneh balls are ready, you place them in an olive oil filled jar, and no need for a fridge then. 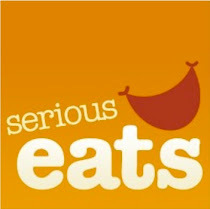 Hope this answered your Q.
your blog is to die for - so full of beauty and deliciousness. I'm so intrigued to try this technique out, the whole process sounds like fun (and delish). 1/2 way there! I was wondering how long these will last if put into sterile jars and covered with oil? Thanks. Hi Anonymous. They keep up to 2 weeks without any problem. Just make sure your jar is clean and that the labneh balls are swimming in olive oil :-) Good luck. Looks delicious. Trying to make them with Fage Yogurt, which is a strained yogurt (and hence no need to strain the yogurt to get the Labneh). Hopefully it'll work out. These are so stunning, and your photos are the best! 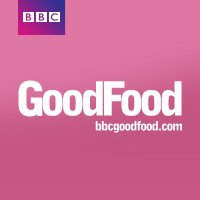 Here in UK, I make these with Total (full fat), or Goats Milk yoghurt and they are heavenly. I tried adding garlic after the water was strained, and was not a good idea, yuk! They are nicest just with a few herbs in oil! I use Fage (Total) too, and even tho its strained, it's still not labneh, you have to strain it to remove all the water! But take heart, Fage makes wonderful Labneh! ps, you can't skimp it tho, it HAS to be the full fat one. I saw your reply to Maris, but.. just to clarify and make sure that I understand correctly, it is not necessary to use the refrigerator at all during any part of the process? Note that the "water" drained off is actually whey - the same stuff that is the basis for powdered protein drinks, which contains very easy to digest proteins, minerals, enzymes and more, is basically flavorless and can be substituted for water in baking to add a significant amount of protein to bread, pastries, pancakes, etc.! Don't throw it away! Made one batch last week, and am getting ready to make another, so that will tell you how well it turned out. ^_^ I was excited to see the labneh in ball form, which is how I remembered it from my favorite Lebanese restaurant in Cairo, and hadn't been able to get it this way in the states. Turned out really well, although it was really messy to shape! I may have done it before it was drained enough, I don't know. Thanks for the great recipe! You can refrigerate it whilst you are removing the whey. It's not necessary though, just leave it where it can drip in a piece of tied muslin. Either over a sink, or in a sieve over a bowl. Leave for 48 hours for best results. For my Labne at home I used butter muslin which is a fine cheesecloth. If you dont have access to that, then boil 3 cotton tea towels in boiling water for 10 mins, strain then with clean hands drain and wring the cloths untill they are as dry as you can get. Use as you would the muslin. I found adding a teaspoon of garlic salt to my yoghurt before straining worked wonders and the flavour was great. 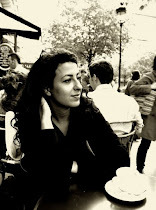 Marianna - I've just found your blog and I love it! Just a question about the Labneh... if I don't make the actual balls and just keep it has a 'dip' without the olive, do I keep it in the fridge just like any other yoghurt? "most simplest"??? That's terrible grammer! However, the labneh sounds wonderful and I might have to give it a whirl myself this season! !